Because of our many years of consistent performance, a client in the marine industry contracted with us at Centerless Grinding Service to grind, polish, and straighten a pair of stainless steel propeller shafts. Precision finishing of a propeller shaft is critical to its performance, as even the slightest flaw could cause the shaft to rotate off-center and produce unwanted vibration. Constructed from high strength 17-4 stainless steel and measuring 32' length, finishing these shafts was a challenging task. The technical skills of our grinding specialists finished the diameter to a uniform 7.003" within + 0.000/- 0.003 tolerances along the entire 32' length. We also straightened the shafts to within 0.0005" per foot T.I.R. to meet the requirements of American Boat & Yacht Council standards. 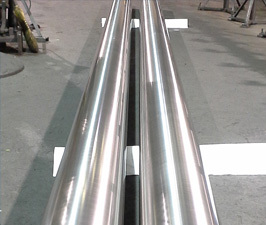 Using our state-of-the-art equipment, we polished both shafts to a 12-20 RMS finish. Throughout the process, we observed strict procedures for handling to protect the workpieces from scratches, nicks, or other potential marring. Continual inspections ensured that we satisfied the requirements of the client specification and provided documented verification to support the certificate of conformance. We also took proper precautions for packaging to keep the shafts safe and the dimensions true during shipping. The entire process took about a week to complete. If you are interested in learning more about this project or the processes we used to complete it, contact us today.